When resigning from a job, it is always a good idea to leave on a positive note. After all, you might need to ask your employer for a reference or letter of recommendation. One way to leave on a positive note is to write a polite, professional resignation letter in which you thank your boss for your time at the company. Read below for tips on writing a resignation letter, as well as two sample resignation letters. 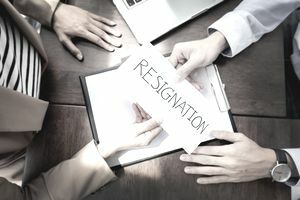 In the first resignation letter example, you confirm that you are leaving and thank the company for a rewarding experience. In the second letter example, you say thank you and offer to provide assistance during the transition. Here are some tips for writing a resignation letter. Whenever possible possible, tell your boss about your plan to resign in person first. Then, follow up with an official business letter. Send a hard copy letter after you speak with your boss. Send a copy to both your boss and the human resources office, so that the letter goes into your file. However, if time is of the essence, you can send an email instead. You can send the email to your boss, and carbon copy (cc) the email to human resources. Make sure to follow proper business letter format in your letter. Include a header with the employer’s name and address, the date, and your name and address. If you are sending an email, read here for tips on writing a professional email. In the letter, state the specific date you plan to leave work. Try to give at least two weeks notice. Two weeks is considered the standard amount of time for giving notice. If you need to leave sooner, read here for information on how to resign with no notice. You do not have to go into detail as to your reasons for leaving. You might simply say, “I was recently offered a new position” or, even more simply, "I am writing to confirm my resignation." You may choose to provide a bit more information (for example, the name of the company or the position, or the reason you are taking this new job). However, keep the letter brief. You might need to ask your employer for a recommendation in the future. Therefore, stay positive when you talk about your experience at the company. Don’t go into detail about how this new job is so much better than your current job. If you are leaving because you dislike the job, do not go into detail as to why you are unhappy. If possible, offer to help the company during the transition period. You might volunteer to train a new employer, or help in some other way. Include an email address and/or phone number where you can be reached once you leave the job. You can include this information in the body of the letter, and/or beneath your signature. Whether sending a letter or an email, you should thoroughly proofread your message before sending it. Again, you may need to ask for a recommendation from your employer, and you want all your work to be polished. This is an example of a resignation letter with a thank you. Download the resignation letter template (compatible with Google Docs and Word Online) or see below for more examples. This letter is to confirm my resignation as the Online Editor at Acme Company. I have accepted a position as Senior Online Editor at a growing media company in New York. I am looking forward to my new position and the challenges that await me. You can always reach me at 555-555-5555 or thomas.applicant@email.com. My experiences at Acme have been very rewarding. I appreciate having had the opportunity to work for such a fine company, and I wish you and the company continued success. I would like to inform you that I am resigning from my position as Customer Service Manager, effective July 12, 200X. Thank you so much for the opportunities for professional and personal development that you have provided me during the last ten years. I will always appreciate your mentorship as I navigated my first management position. I have appreciated working at the company and value the support provided me during my tenure with the company. I greatly enjoyed working with you, and wish you well in your future endeavors. I am also happy to provide any information or training for my replacement, if this would be useful. You can continue to contact me at 555-555-5555 or yourname@email.com.